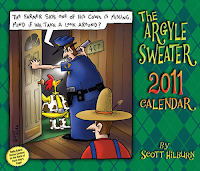 You are here: Home / The Argyle Sweater News and Updates / SOLD OUT! My apologies to those of you who’ve e-mailed about the 2011 box calendar. My publisher has confirmed that they’ve sold out online at Barnes and Noble, Borders and until recently, Amazon.com. My name is Carlos and I'm a web geek over at Calendars.com. Just wanted to let the fans know that we at the office are super excited to get this calendar out the door and into your hands! Look forward every am to see if I can figure out the twist of ur cartoon. U definetly have a twisted sense of humor!